[amazonify]B000HCT12O:right:product[/amazonify]An old Logitech mouse I had broke recently so I began looking for a new mouse. Since I spend a LOT of time at this computer, I need something that’s comfortable, and very functional. I’ve come to rely on middle button click to open links in new tabs in the FireFox browser, rely on the forward/back buttons on the side, etc., so I can’t go back to something basic. So recently I bought a [amazonify]B000FFEUII::text::::Microsoft wireless mouse 5000[/amazonify] mouse from Newegg. BIG mistake. First off, it’s junk – very cheap and light. I should have known because in fairness, it is cheap, as in inexpensive. Second, I have big hands and found the positioning of the forward/back buttons on the side way too far back so I had to make a very awkward move to get to them. Finally the middle scroll wheel ‘click’ was way too hard to engage and definitely gave me hand ‘ache’ after hours of use. So I’ve been on the prowl for a new mouse. 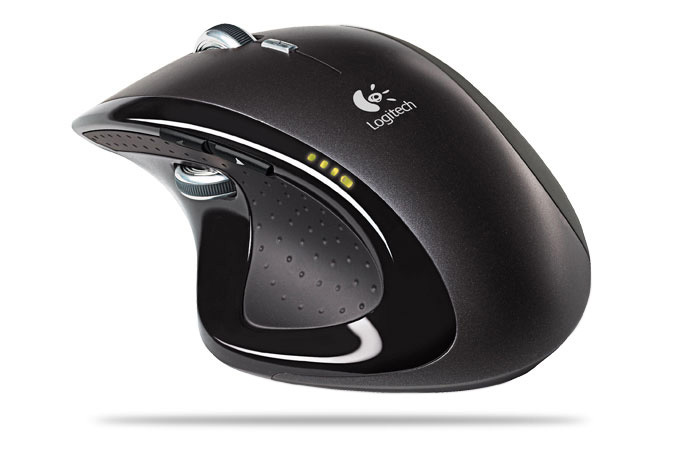 I’ve been eyeing the [amazonify]B000HCT12O::text::::Logitech MX Revolution mouse[/amazonify] for a while, which they claim is the “world’s most advanced mouse.” Lofty stuff, so I broke down and got one. Figured I could return it if I really don’t like it. Well so far I’m AMAZED. First thing that’s different is the shape. Instead of a regular ‘big egg’ shape, this one has a concave area for the thumb which is VERY comfortable. I like a mouse that requires VERY LITTLE EFFORT to click, scroll, move, etc. This mouse is very light in use, although not light in overall weight so as to feel like a piece of junk. It’s very nicely made as are all Logitech products I’ve found. The regular scroll wheel on top was a bit baffling initially, as it has the usual ‘detents’ or click-click-click positions as it rolls, but I could also press it down and it would engage into a ‘free spinning’ mode which is GREAT for fast scrolling through big documents – you can get it spinning like a top and just keep your finger off it and the doc keeps scrolling until the wheel stops. BUT, one I got the bundled software installed, I learned that the mouse can ITSELF engage whether the wheel is free spinning or ‘click-click-click’ (click to click is what they call it) and you can program how it engages or whether it’s always in one more or the other! Since I like a light touch I’ve told it to be in spin mode all the time but you can tell it to be in click-click mode up to a certain speed and then switch over to free-spinning – it’s amazing. Even better, with the software, all functions of everything are programmable for EACH application you use if you wish. So you might have certain functions for gaming, and certain for web surfing, etc. 1) it uses one of those tiny transmitter USB sticks and in my case that means it’s a long way from where the mouse is. It seemed to work plugged into the back of my PC under the desk in the corner, but I’d had problems with the crap Microsoft mouse interfering maybe with my Logitech keyboard I think so anyway, I have the mouse stick plugged into a USB extension cable to get it close to the mouse. 2) It has built in Lithium Ion rechargeable batteries and has a little cradle for recharging. Apparently a charge lasts a good long time (a few weeks? I don’t know yet) but my last Logitech mouse begun to only last a couple of days so we’ll see, while cordless mice I’ve had with AA alkalines seem to last MONTHS and MONTHS without changing. So far I think I’m going to really enjoy this! Will report back if that impression changes.